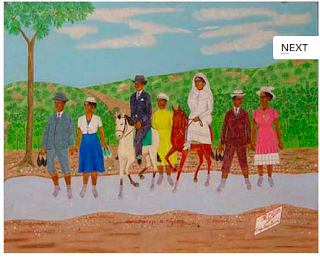 Philomé Obin was a Haitian painter. He was arguably the greatest of all Haitian artists - his main rival for that accolade is fellow painter Hector Hyppolite. Philomé Obin was born in Cap-Haïtien, the third child of Mr. and Mrs. Obénard Obin. He received rudimentary instruction in drawing as a boy and produced his first known painting in 1908. He was still working at his art three-quarters of a century later. Most of the paintings of Obin’s first half-century - often on cardboard, sometimes on masonite - are lost. They were, in any event, unappreciated by middle-class Haitians who preferred works that aped French paintings; they did not value Obin’s representations of Haitian street scenes or his visions of Haitian history.Through the eyes of a painter. A native of Port-au-Prince, Benoit had been a shoemaker, musician, and taxi driver before making his living as a painter. He had also supplemented his income by painting pottery, pieces he rarely signed or acknowledged. 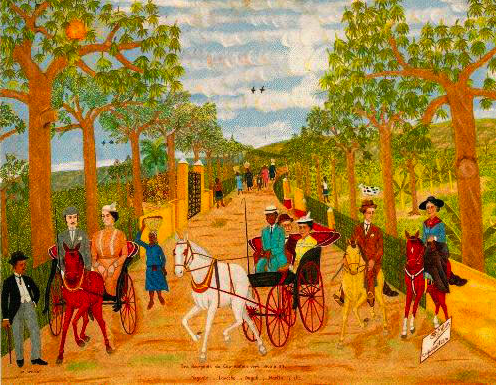 Benoit was an early member of the Haïtian art movement known as Naive Art, so-called because of its members' limited formal training. The movement was first recognized and promoted by the Centre d'Art, founded in 1944 by the American Quaker and World War II conscientious objector Dewitt Peters. According to a widely repeated story, Benoit was working as Peters's chauffeur in 1944 when he saw some of the first works displayed at the Centre d'Art. He immediately decided he could do as well as any of the featured artists. Late in life Benoit denied that tale, insisting that he had merely visited the Centre out of curiosity before submitting his first works to Peters. His paintings were immediately among the Centre's most popular. 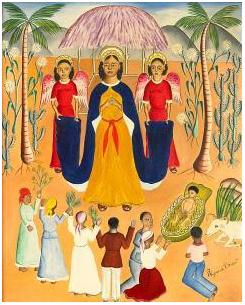 Some of Benoit's later work was surrealist, though he continued to produce scenes of Haitian life—narrative scenes—until his death. 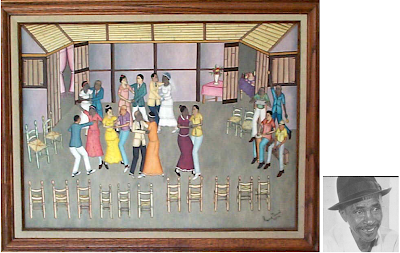 The tradition of artistry is still alive and well in Haiti. Later this week, we will feature an organization dear to our hearts which created a platform for Haitian art to be purchased around the world.